A crash on westbound Hwy. 169 has cleared and traffic is getting back to normal. The latest snag on the system is a wreck on northbound I-35W at Black Dog Road. Traffic is jammed in the area at 8:40 a.m.. Eastbound I-94 at Hwy. 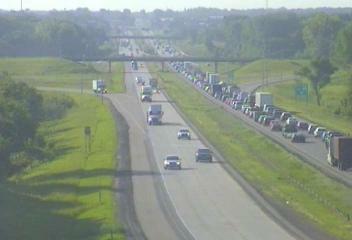 241 is starting to loosen, but a long line still is in place due to an earlier crash at the Crow River. A pair of fender benders are adding to the congestion on westbound I-694 in Fridley. Watch for the flashing lights and activity between University Avenue and Central Avenue. The slowest drive is along Interstate 494 between Hwy. 169 and Cedar Avenue. Either direction will take about 15 minutes at this hour. Look for sluggish conditions on eastbound Hwy. 212 from Dell Road over to I-494 also is moving a tad below the posted. Croweded, but nothing unusual on the Crosstown westbound from Cedar Avenue to I-35W and on westbound I-94 from Hwy. 280 to the Lowry Hill Tunnel. Both drives are 15 minutes. 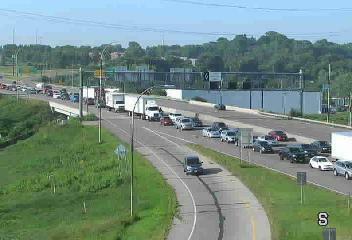 Traffic also is tight on northbound I-35W between 50th Street and Lake Street.